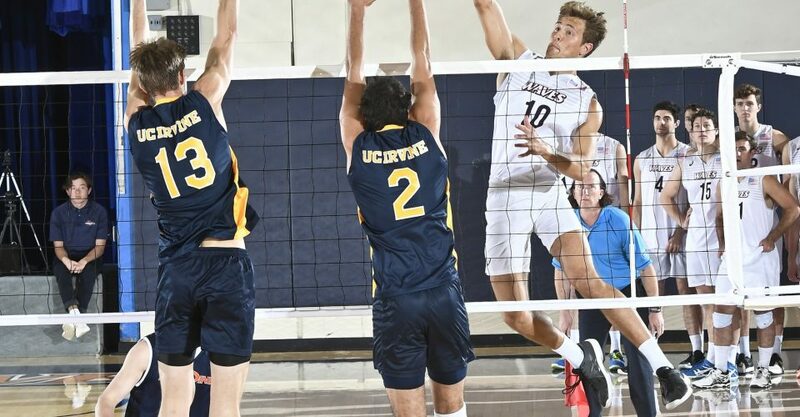 The Pepperdine Men’s Volleyball team continued their regular season run on Saturday with a 3-0 victory over the UC Irvine Anteaters. It was a top ten matchup as the Waves came into the game as the No. 4 team in the country and the Anteaters were No. 6. Back in January the Anteaters handed the Waves their second of only six losses. They lost in four sets in a match that the Anteaters controlled throughout. Since the loss, the Waves have won ten out of their last 14. The Waves started off extremely consistent and were attacking offensively. Six of their first ten points came off kills by the senior trio: Kaleb Denmark, David Wieczorek and Michael Wexter. After the Anteater’s timeout, the Waves came out firing again and quickly distanced their lead. The first set concluded with back to back service aces from Wieczorek and a kill from Wexter. In the second set, Pepperdine continued setting up their outside hitters and pulled out to a 14-8 lead before another UC Irvine timeout. The Anteaters battled back to make it a 17-14 game before Pepperdine coach David Hunt called a timeout of his own. The Waves sustained their lead throughout and won 25-20 in the second set. The third set was the most competitive. The teams traded leads four ties and three lead changes in the early portion of the set before the Anteaters took a five point lead with a score of 16-11. The Waves went on a 10-4 run and retook the lead, 21-20. The teams continued to trade points before redshirt sophomore setter Robert Mullahey, who had 38 assists on the night, called his own number on the last point with a tip in the weak spot of the Anteater defense. The Waves won 26-24. Denmark, Wieczorek and Wexter all had double digit kills on the night with 11, 14 and 14, respectively. The front line of the defense did their part with four assisted blocks. Hunt said he is pleased with how the team has been practicing. Hunt said that the team has noticeably improved since the last time they played UC Irvine. The Waves have four regular season games on their schedule before the Mountain Specific Sports Federation tournament. The Waves lost to University of Southern California in the quarterfinal last season. Hunt said that he feels the team is ready for a deep postseason run. The Waves will host the University of California, Los Angeles Bruins on Wednesday.